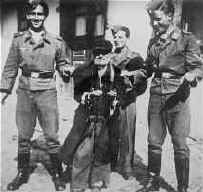 Germans publicly humiliate an elderly Jew. Before beginning a Holocaust unit, eighth grade students view a presentation concerning Guidelines for Teaching About the Holocaust as developed by the United States Holocaust Memorial Museum. Students come to understand why the unit they are about to study is of such great importance. Contextualize the history you are teaching. Strive for precision of language. Avoid simple answers to complex history. Just because it happened does not mean it was inevitable. Try to avoid stereotypical descriptions. Strive for balance in establishing whose perspective informs your study of the Holocaust. Make careful distinctions about sources of information. Do not romanticize history to engage students‘ interest. Be sensitive to appropriate written and audiovisual content. Reinforce the objectives of your lesson plan. Launch Guidelines for Teaching the Holocaust (PowerPoint).